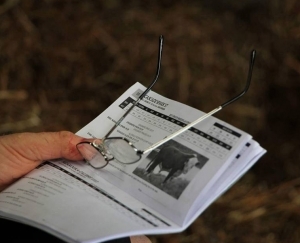 Each selection index describes a different production/market scenario and relates to a typical commercial herd in New Zealand that is targeting the following specifications. 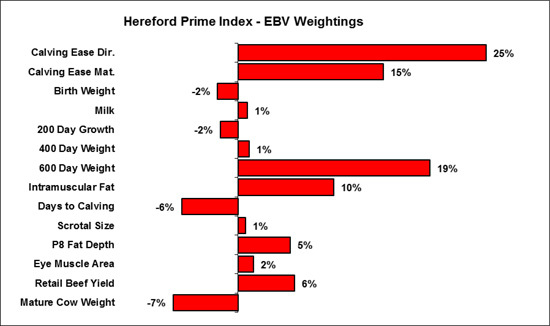 Hereford Prime Index - Estimates the genetic differences between animals in net profitability per cow joined for an example commercial self replacing herd where Hereford bulls are joined to either Hereford or British breed females targeting the production of grass finished steers for the Hereford Prime program. Steers are assumed marketed at 510 kg live weight (275 kg carcase weight and 10 mm fat depth) at 20 months of age. Daughters are retained for breeding. 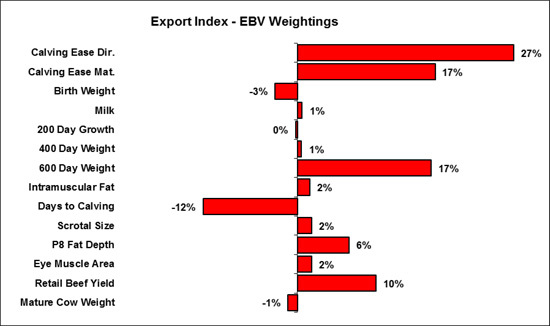 Export Index - Estimates the genetic differences between animals in net profitability per cow joined for an example commercial self replacing Hereford herd targeting the production of grass finished steers for the export trade. Steers are assumed marketed at 600 kg live weight (330 kg carcase weight and 10 mm fat depth) at 20 months of age. Daughters are retained for breeding. Dairy Maternal Index - Estimates the genetic differences between animals in net profitability per cow joined for an example commercial dairy herd targeting the production of dairy beef progeny. All steers are assumed marketed at 500 kg live weight (260 kg carcase weight and 6 mm fat depth) at 20 months of age. The Hereford Dairy cross heifer progeny are particularly sought after as beef breeding cows and consequently, maternal traits are of importance. 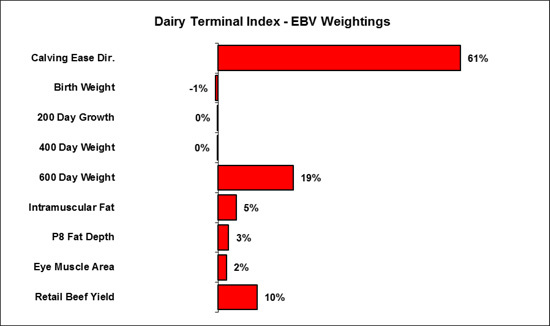 Dairy Terminal Index - Estimates the genetic differences between animals in net profitability per cow joined for an example commercial dairy herd targeting the production of dairy beef progeny where all progeny are slaughtered. Steers are assumed marketed at 500 kg live weight (260 kg carcase weight and 6 mm fat depth) at 18 months of age. All selection indexes are reported as an EBV, in units of relative earning capacity ($) for a given production/market scenario. They reflect both the short term profit generated by a sire through the sale of his progeny, and the longer term profit generated by his daughters in a self replacing cow herd (where applicable). All selection index values have been derived using BreedObject technology. More detailed information regarding each selection index is provided on the following pages. If you have any further queries regarding New Zealand Hereford Selection Indexes, please do not hesitate to contact staff at the New Zealand Hereford Association. The Hereford Prime Index estimates the genetic differences between animals in net profitability per cow joined for an example commercial self replacing herd where Hereford bulls are joined to either Hereford or British breed females targeting the production of grass finished steers for the Hereford Prime program. Steers are assumed marketed at 510 kg live weight (275 kg carcase weight and 10 mm fat depth) at 20 months of age. Daughters are retained for breeding. Considering the genetic relationship between the key profit drivers and the EBVs that are available, this transposes to the following EBV emphases. The sign indicates the direction of the emphasis. 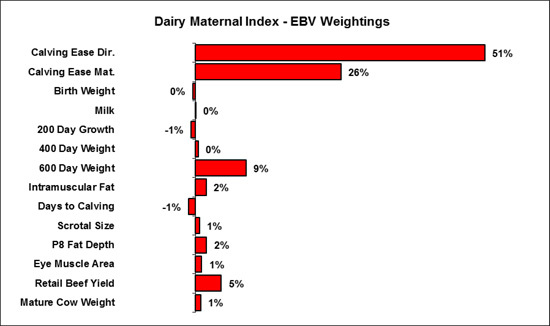 For example, greater 600 Day Weight EBVs and shorter Days to Calving EBVs are favoured. 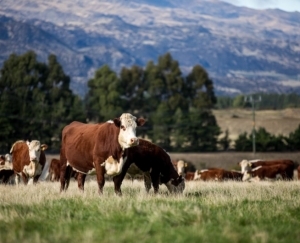 The Hereford Export estimates the genetic differences between animals in net profitability per cow joined for an example commercial self replacing Hereford herd targeting the production of grass finished steers for the export trade. Steers are assumed marketed at 600 kg live weight (330 kg carcase weight and 10 mm fat depth) at 20 months of age. Daughters are retained for breeding. The Hereford Dairy Maternal Index estimates the genetic differences between animals in net profitability per cow joined for an example commercial dairy herd targeting the production of dairy beef progeny. All steers are assumed marketed at 500 kg live weight (260 kg carcase weight and 6 mm fat depth) at 20 months of age. The Hereford Dairy cross heifer progeny are particularly sought after as beef breeding cows and consequently, maternal traits are of importance. Considering the genetic relationship between the key profit drivers and the EBVs that are available, this transposes to the following EBV emphases. The sign indicates the direction of the emphasis. The Hereford Dairy Terminal Index estimates the genetic differences between animals in net profitability per cow joined for an example commercial dairy herd targeting the production of dairy beef progeny where all progeny are slaughtered. Steers are assumed marketed at 500 kg live weight (260 kg carcase weight and 6 mm fat depth) at 18 months of age.